Movement: 37A, SEIKO Suwa factory , Electronic. Glass: Original, crystal glass, fine. Band : Original, signed "SEIKO", it fits for wrist of 18.5 cm or less. Battery: My watchmaker tried to replace the battery, but the watch does not work. Day/Date: Works fine manually (crown pushed, semi quick-set), English. It is described on page 24, 52 of the book Japan Domestic Watch Vol. 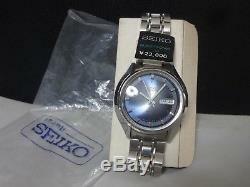 The item "Vintage 1972 SEIKO Electronic watch EL-370 3703-8010 for parts" is in sale since Tuesday, July 31, 2018. This item is in the category "Jewelry & Watches\Watches, Parts & Accessories\Wristwatches". The seller is "saitama_jp" and is located in Saitama. This item can be shipped worldwide.